^ Belfort, Jordan (February 24, 2009). Catching the Wolf of Wall Street. Bantam Dell. http://books.google.ca/books?id=zBcP-i41kcEC&pg=PA442&dq=Max+Leah+Belfort&hl=en&sa=X&ei=-qGJUcmWJdStrgG7vIDgCA&ved=0CCMQ6AEwAA 2013年6月23日閲覧。. ^ Belfort, Jordan (September 25, 2007). The Wolf of Wall Street. Random House Publishing Group. p. 47. ISBN 978-0-553-90424-6. http://books.google.com/books?id=GLLCyNj-IUoC&pg=PA47. ^ Straney, Louis L. (2010). Securities Fraud: Detection, Prevention, and Control. Hoboken, New Jersey: Wiley. p. 133. ISBN 9780470601570. OCLC 696918833. http://books.google.ca/books?id=-UT8QMXywl8C&pg=PA132&lpg=PA132&dq=Jordan+R+Belfort&source=bl&ots=4tjDX_3vBD&sig=H0sL35dQYz5GlowzV1oKMI42Zds&hl=en&sa=X&ei=xqDEUtSEC-KQyAGN74DADA&ved=0CFIQ6AEwBg#v=onepage&q=Jordan%20R%20Belfort&f=false 2014年1月14日閲覧。. ^ a b Gray, Geoffrey (November 24, 2013). “The Wolf of Wall Street Can't Sleep”. 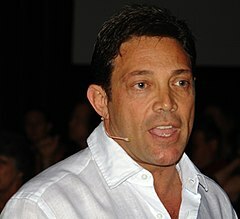 New York: 64-69. http://nymag.com/news/features/jordan-belfort-2013-12/ 2013年12月30日閲覧。. ^ Wooton, Kenny (May 1997). “The Longest Night”. Yachting 181 (5): 54. ISSN 0043-9940. ^ Belfort, Jordan (2007). The Wolf of Wall Street. Random House. pp. 406-409. ISBN 978-0-553-80546-8.